OnePlus has introduced its official ‘BuyBack Program’ on the e-store oneplusstore.in in partnership with Cashify, India. The program allows users to upgrade their existing device to the latest OnePlus device with the assurance of the best exchange value. 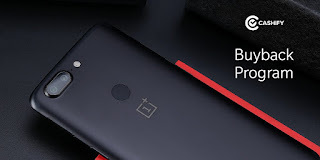 As a part of this program, customers can get instant cash for their used smartphones when they purchase any OnePlus device on oneplusstore.in.The program will allow users in over 30 cities to get upto 100% of market value of their old smartphones in instant cash within 72 hours of purchase. Notably, the buyback value offered on oneplusstore.in is considerably higher than the value offered by other major e-commerce platforms. Currently, all major brands are supported under This program across over 30 cities including Ahmedabad, Agra, Bangalore, Bhopal, Baroda, Vadodara, Chandigarh, Chennai, Coimbatore, Delhi, Faridabad, Ghaziabad, Gandhinagar, Gurgaon, Howrah, Hyderabad, Secunderabad, Indore, Lucknow, Jalandhar, Kanpur, Kolkata, Ludhiana, Mohali, Mumbai, Noida, Nagpur, Navi Mumbai, Pune, Puducherry, Panchkula, Surat, and Thane.